Here we have the start of the dummy stoker engine. 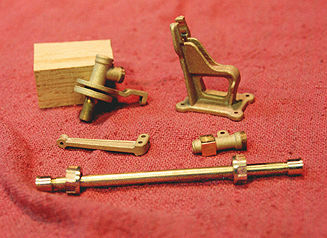 Just some 1/8" brass so far. 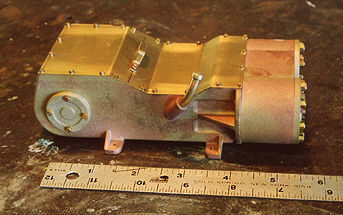 Partially completed stoker engine, fitting the sheet metal lid. Here we have the completed stoker engine. Isn't it amazing what you can do with some brass and a little silver solder. One thing you can do when simulating a casting and you want some texture is to go over your work piece with a dull center punch and then sand blast it with some coarse sand. Even though this is just a dummy stoker engine it actually serves a purpose on the Berkshire, it hides the left-hand injector, as the full size engine had no injector on this side. The injector is tucked up into the stoker engine, and the delivery line comes out where the stoker exhaust would be. On the full size Berkshire there is a large exhaust line running from the stoker forward and disappears behind the Worthington hot water pump, just perfect for an injector delivery line. 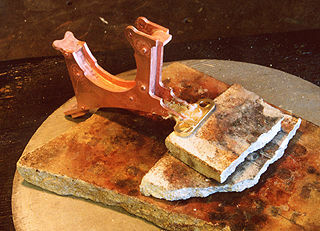 Modern steam had many examples of the pattern maker, and foundry mans skill. One example on the Berkshires was the running board supports. 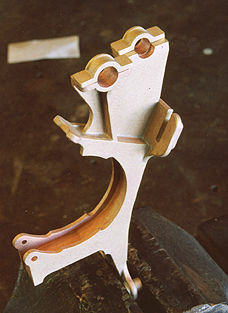 These were very complicated castings that had brackets for the air tanks, assorted plumbing, and on one, there is a platform for part of the original screw type power reverse. 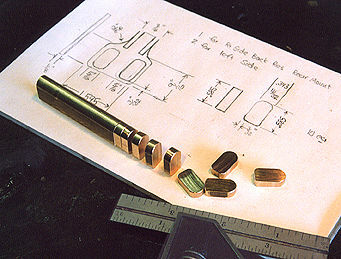 As making patterns for these parts is beyond my abilities they were fabricated from brass. There are six of them and they are all different with many little bits to solder together. This photo shows the mounting pads that fit against the boiler. Here we are silver soldering the upper mount to the main body of the support. When soldering complicated assemblies like this, flux everything and put it together with little screws that can be filed off later. Always solder on a piece of fire brick, not on a steel work table. 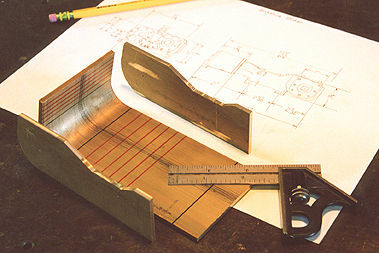 A steel work table will wick all the heat out of your work piece. Completed support with plumbing clamps. 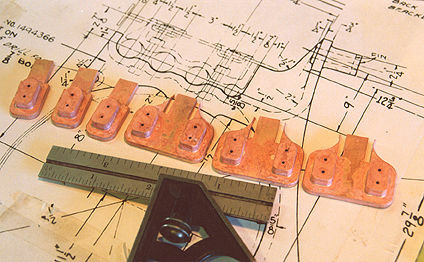 Here we have all six running board supports representing about sixty hours of work. Large modern steam is festooned with little bits of jewelry like this, and it just seems to go on and on. Nickel plate Berkshires had a Nathan low water alarm mounted on top of the boiler. Here we have the beginning's of one. 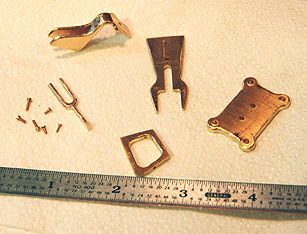 Low water alarm pieces ready for assembly. 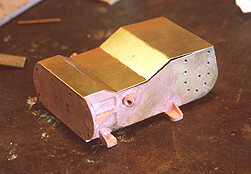 The parts that represent castings have been sand blasted with coarse sand. Completed low water alarm. It's very interesting how these alarms worked. They mounted to the top of the boiler with a pipe from the left end entering the boiler vertically and extending down to minimum water level. As long as water covered the bottom of this pipe, the upper horizontal tube of the low water alarm would fill with condensate. If the water in the boiler fell below the bottom of the vertical pipe, the condensate would drain from the alarm allowing the horizontal tube to fill with steam. When this happened it caused the horizontal tube to heat up and expand. 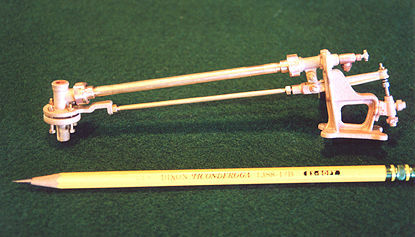 As the metal rod under the tube didn't expand, it caused the lever connecting them to push down the plunger at the lower right, opening a valve that blew a whistle in the cab. A friend of mine who has a lot of experience with full size stationary boilers said they had exactly the same alarm, but that instead of blowing a whistle, it turned on the feed water pump.